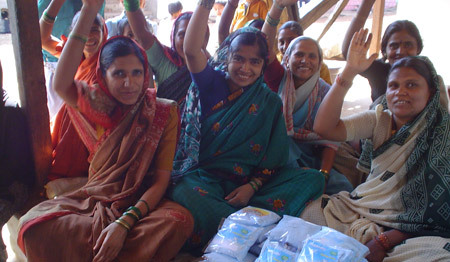 Livelihood programmes typically focus on manufacturing skills, credit linkages and resource availability. Participants are not trained to think about markets until they are ready to sell. When production precedes marketing, they may be confronted with inadequate demand resulting in wasted effort, resources, perhaps even mounting debt. Without adequate market orientation, poor entrepreneurs lack the wherewithal to switch to more profitable enterprises when markets fail. Our experience indicates that the survival rate of micro-enterprises increases significantly when entrepreneurs are market oriented from the outset. 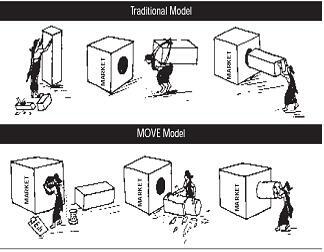 In 2004, after several attempts, we introduced a participatory training model called Market Oriented Value Enhancement (MOVE). Originally developed for landless, illiterate rural women, MOVE is now recognised as a practical, profitable and very low risk approach to creating sustainable market niches. Over the years it has been replicated and adapted for poor youth, quarry workers, beedi workers, sexual minorities and women with HIV/AIDS. MOVE has 255 successful businesses across West Bengal and Karnataka to its credit so far. Download an independent evaluation of BPF's MOVE pilot project in Amta-I Block, Howrah, West Bengal, by Dr Ashok Sircar here. Download an independent evaluation of BPF's MOVE project by Carla Annick Barlagne here. MOVE emphasises market knowledge - What does my customer want? How can I deliver it? - as a pre-condition for investment. Training in its 12 modules involves motivation, market visits and surveys, and nurturing businesses until they are firmly established. The importance of the customer is continually emphasised. A typical batch of 25-30 participants can start businesses between four and six months into training. Our Participatory Market Appraisal (PMA) tool enables trainees to conduct market research independently without having to rely on external expertise. Using PMA, they create visual surveys to understand market size and potential profits. 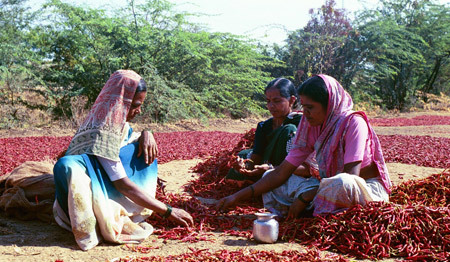 They acquire an understanding of market dynamics, such as the basics of buying and selling, identifying profitable business niches through market visits, building customer relations and adding value - large scale industries may be able to produce more at a cheaper price, but small entrepreneurs, by virtue of their direct access to customers, can provide customised products at the doorstep and meet a myriad of needs in ways that the former cannot. The trainees finally devise a marketing strategy and business plan that incorporates a vision for future expansion. It is only at this stage that they are deemed capable of entering the market, linking to banks and continue adapting successfully to changing market conditions. This creates the lowest risk pathway for the asset-less poor to start businesses and see quick returns. Born and raised in Magad, Bashira comes from a family of agricultural labourers. After marrying Mabusab, she lived at first in a joint family with Mabusab's parents and five siblings. A dispute with her inlaws left her with an injured right hand so the couple eventually moved into a place of their own, a six by ten foot thatch-and tile hut. 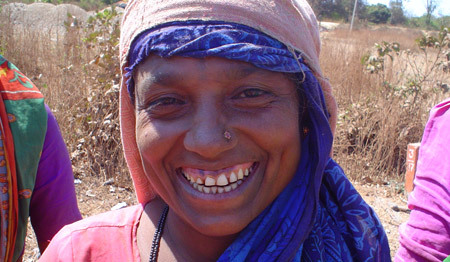 Bashira worked as an agricultural labourer, walking long distances to the forest to collect head-loads of wood that she sold in the village and sometimes in neighbouring Dharwad. By the time her two children Makhtum and Sania came along in the next 11 years, the family earned enough to eat but had no savings. "We lived in the same hut, did the same work to survive and had no exposure to the outside world," she says. Then, in 2001 (BPF's MOVE master trainer) Pawadshetty came along and said he wanted to organise a women's self-hel[ group. "I was scared to talk to men and my Kannada was not fluent, so I went to (BPF's MOVE master trainer) RB's house and spoke to his wife. She explained to us about the SHG and the women in our street decided to form the SHG. We were taken on a exposure to show how SHGs in other villages work. I started talking to male officers and going to school, banks, the panchayat office. We also got several trainings where we discussed and started getting the confidence to go out. One day the gramsabha was announced and we decided to attend. During the discussion I asked if there was any possibility of help to repair my house. Other members supported me and I was sanctioned Rs 20,000 to renovate my hut. I had to make 10-12 visits to the GP for the final sanction. I took a loan ogf Rs 10,000 from my SHG, another bank loan of Rs 7,000, another of Rs 20,000 against my gold jewellary and raised about Rs 3,000 from relatives". Now the proud owner of a pucca house with a cot, chairs and TV set, Bashira credits her prosperity to the exposure and opportunities she received as a member of her SHG. There, she gained the confidence to go out independently and meet people, speak to them. She learnt to manage her own business and began to save. She was able to take loans and even trained women in SHGs in the neighbouring villages of Managundi and Kyarakoppa to make soap. "I learnt to solve my problems," Bashira tells us, proudly. Muthu had been a carpentar for over a decade but at 29, he was far from satisfied with his career. He needed a boost. When the oportunity to train in MOVE presented itself, he says he "grabbed it. There was no such opportunity for me to learn business before". 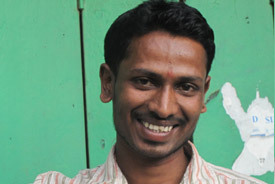 Muthu is convinced that acquiring the skills he did at MOVE changed not only his own life but that of his entire family. He began to share what he learned with his mother, who runs a grocery store. Now she has improved her business too. 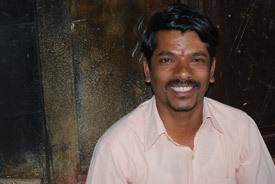 Muthu runs a screen printing business in addition to his carpentary. 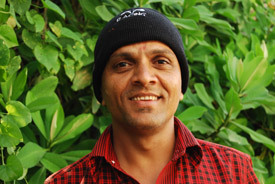 "Before I joined MOVE I was a labourer, not a businessman," he says. He credits his rise in income --his monthly profits have risen to about Rs 8,000 from an average monthly income of Rs 2,000 - to what MOVE taught him about dealing with customers and marketing himself. "Earlier I didn't even think about (publicity and marketing)," he says. "Now if there is a fair or an event for which I screenprint posters, I make sure I use the opportunity to advertise myself too by putting my name and contact details in a corner of the poster." And he makes sure that he is always accssible to customers and potential customers by giving two addresses - one at the bus stand where he is available in the morning, and another at a hotel where he works from in the evening. The next step for the young entrepreneur is to specialise in wood carving. "I am a good carpentar but want to excel in carving. The MOVE PMA tool helped me see the huge demand for that service and that there is noone here who does it." 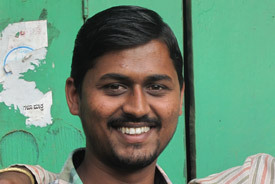 Muthu dreams of having a huge carpentry and wood-carving factory with many employees. He has already bought machines worth Rs 3,000 and employs four contract labourers. "As a child I wanted to get into a government job. Now I want my own business - a big factory - and to give jobs to other people. (Business) is better than a government job. There is more freedom and satisfaction here. It is very evident that Muthu's carpentary is not just his means of livelihood. It is his passion. He can be found reading books on carpentary, meeting other carpentars, observing their work and learning from them, even on his days off. Determined to keep learning, he has approached several professionals in Dharwad. Only one has responded in the affirmative. The rest, he says, are afraid of the competition. Seeing his passion, determination and ability, one is not surprised they are! After her MOVE training in 2009, Mahadevi Hiremath decided to invest Rs 23,000 to start her own flour mill in her village Mandihal. 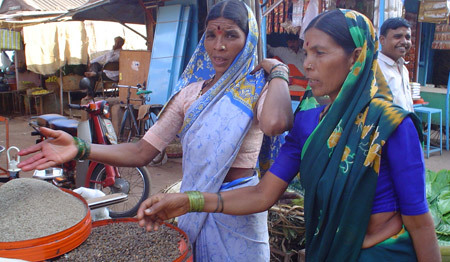 She began by grinding grain at the rate of Rs 10 per kilogram, making a monthly profit of Rs 2,600. Gradually, she decided to extend her business to increase her profits. 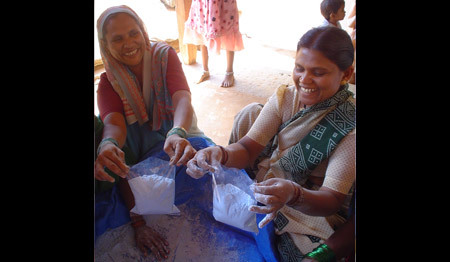 After much deliberation, Mahadevi decided to value add by buying whole millets that she would grind and package. BPF took her on numerous market visits to help her acquire a thorough understanding of her undertaking. Today, Mahadevi's turnover has increased by Rs 800. 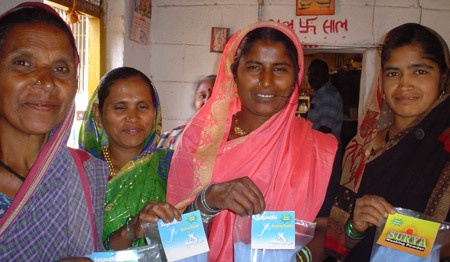 She now plans to retail her millet powder packs at shops such as Desi to increase her customer base. When Anand started his vermicelli business in 2008, he sold 100-120 kilograms a week during the seven to eight months that production was possible. This allowed him to earn around Rs 12,000 for every month of operations. With the skills that he gained from MOVE training, Anand decided to invest Rs 180,000 of his own savings in larger capacity equipment and electrical infrastructure to power it. He now produces 60 kilograms of vermicelli that he sells to up to eight customers a day, some of who place bulk orders in advance. His monthly profits have increased to about Rs 30,000. Recognising the demand, he is considering increasing production to at least 100 kilograms a day and selling through wholesalers. Although that would lower his profits slightly, it would significantly raise the volume of his sales. Once he generates enough orders, he intends to hire two waged labourers to assist in production, drying and packing. Anand says that the most valuable lesson he learned at MOVE was to improve his marketing approach. "I make sure to build good relationships with my customers, offer a consistently good quality product, my supply is reliable and my standards, hygienic," he says. 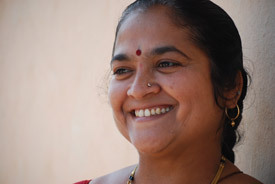 When 39-year old Uma's husband passed away, she not only lost her partner and provider, but her status as a married woman in her husband's family. What she was left with was two small children and the realisation that she would be raising them alone. When the opportunity to train in MOVE came along, Uma grabbed it. There, she says, she learnt to run a business, calculate how much she should invest and how much she could expect as profit. Today, she has multiple small businesses, including a tailoring and picot service, pappad and paper bag making, and a small grocery store. She credits the PMA with giving her the ability to compete on price. She has developed the confidence to talk to her customers about their desires and expectations, and meet them. Uma does not worry about her business performing badly. She does not believe it will, but if it does, she feels confident about her ability to negotiate the market. "I would go to other shops to sell my pappad," she says, "and I'd start another business if I had to". 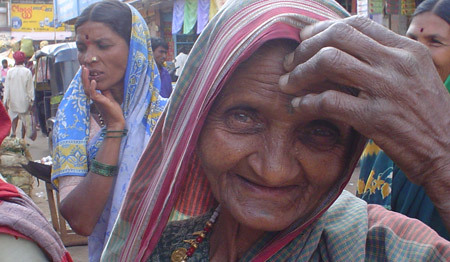 As of now, she revels in the fact that her status and that of her children has improved at home and in the community. The children have nice clothes to wear now, and she has the peace of knowing that her in-laws are proud of her for being able to provide for her family independently. Umesh is a 20-year old MOVE trainee who was inspired by his mother, also a MOVE trainee. When financial difficulties at home demanded that he contribute to the family income while still in college, he took a job at the LIC administrative office, earning Rs 3,000 as a scanning operator. However, the work hours clashed with his college schedule so he was forced to switch to a lower paying job at the Nokia Customer Care division. It was around then that Umesh decided to train in MOVE, following which he started a mobile shop with his friend, Mahilar Kittur, also a MOVE trainee. The boys divided the profits, with Umesh taking home Rs 1,000 in the first month and Rs 1,500 in the second. His parents support and encourage his ventures and he is more confident about his future now. "I want to expand the mobile business and start another shop in the city. I never wanted to work under any one and MOVE helped me to achieve his ambition," he says. The young man also has a word of advice to others of the same age -- "Start your own business. You will be your own boss and get to work as you wish". 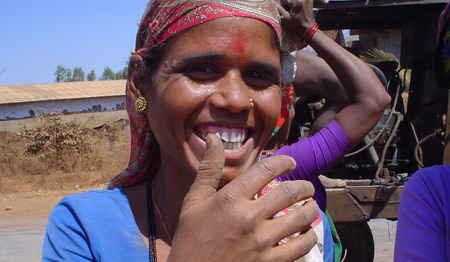 Bashira, a 19-year old resident of Kalakeri village near Dharwad, was a daily wage worker earning Rs 20-30 a day. She describes it as "a dog's life" because she had to hunt for food. MOVE, she says, helped her fulfill her dream of learning how to tailor and run a successful tailoring business for the past two years. She makes about 10 blouses a day, earning Rs 15-20 apiece. Bashira has recently completed a course in fashion design and is in the process of learning embroidery. Her fashion design training has helped increase her earnings to Rs 2,500 a month. With the profits, she has opened a bank account into which she has deposited Rs 5,000 and purchased a sewing machine to which she can add embroidery instruments. Someday, Bashira smiles, she will get married. But before that, she intends to grow her business and become completely self-reliant. 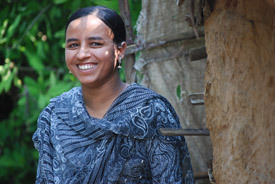 Mahilar Kittur dreamed of owning a computer hardware or mobile business, and working alongside as an electrician or motor mechanic. "MOVE training helped me start the mobile business," he says. The average turnover from the shop is Rs 1,000 a day with a profit of Rs 600. To start the business, Mahilar and his partner Umesh took a loan of Rs 39,000 through their mothers' SHG. They repay Rs 5,000 from their earnings every month. Mahilar saves his share of the profits for his education. He is now in the twelfth standard and intends to pursue higher studies. At first, he says, he was in two minds about whether he should really go into business. Now, he has absolutely no regrets. "I will continue being in business. I won't change it. Earlier, I was tense about whether I would be successful or not, so I thought about doing a job. But now I am confident and want to start another counter as well." At 19, Mahilar is already an inspiration to many. He encourages other youth in his village, "MOVE training is useful; it will help you to start a business". 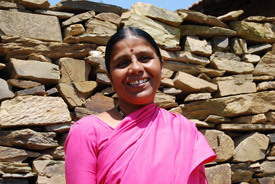 Neelambika, a resident of Narendra village was a housewife when she began training in MOVE. "I always wanted to run a business from home. When my neighbours told me about MOVE, I decided to join the five-day training. My first experience of running a business was during the Eatery game. I earned Rs 47 by selling budgi. I really enjoyed playing the MOVE games as they helped me gain some experience in business, which I did not have before," she explains. Following the training, Neelambika invested Rs 20,000, which she borrowed from her SHG, into items of clothing. "I started by stocking only saris and blouses but after speaking with my customers, I decided to add children's clothing, lungis and men's underwear." While she still needs to repay her 12 per cent interest loan, she has already started making profit. "Since 31 December I have earned Rs 12,000 of which Rs 1,000 was my profit. I feel very good to have a business. I feel I can grow this business in the future and earn around Rs. 1,500-2,000 per month. This is very exciting!" The MOVE Livelihood Enhancement Model is a 12-module programme with proven results in helping socially and economically marginalized individuals lift themselves out of poverty by creating successful and sustainable micro-enterprises. The MOVE manual is an essential resource for local and global organizations seeking to improve livelihood opportunities for the poor. If you are interested in purchasing the MOVE manual, please click on the buy now link to send a request and we will get back to you with details on how to obtain a copy.